Living Reflections (from a dream): Important P.S. to La Serena!! Important P.S. to La Serena!! Talk about forgetting the most important thing we did in La Serena! We took a trip up to the Mamalluca Observatory in the mountains below the Atacama desert. 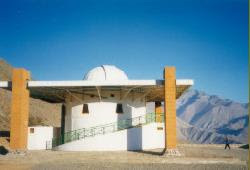 There are observatories all over Chile, including ones from Europe, NASA and US universities, but this is the only one open to tourists. It has a 35 cm lens - compared to the 8 metre lenses on some of the surrounding telescopes. Chile is famous for observatories, as they have the clearest air in the world - a fact that we discovered after getting scorched alive from an hour in the sun!! Anyway, a bus collected us and brought us an hour and a half from La Serena up into the mountains to the observatory. We watched the sun set across the desert mountains, then went inside the observatory, where our English speaking guide turned the telescope to the sky, and we took turns gazing at craters on the moon - it was fantastic looking! He showed us other parts of the night sky, and told us interesting facts about stars and planets. But the moon was the fantastic sight! It was so close you could see someone walking on the moon....should that happen. We then went downstairs, and he gave us a slideshow presentation on the birth of the universe, including a wonderful shot of where we are in the universe, and how bloody small and insignificant we are. Cool. Then we went outside, where it was completely dark, and he took a powerful laser and began pointing out constellations in the sky. Orion was the most amazing, and then he pointed a smaller telescope at the sky, and we all took turns looking at the nebula in Orions knife...the birth of a star. He showed us many constellations, then again we looked in the telescope and saw a beautiful star cluster. I have always been so intersted in astronomy, so this was just fantastic. He said the smaller telescopes - through which you could see star clusters and nebulae - was about 1000 dollars, so myself and Alan think we´d like to buy one! After that we looked back at the moon with the less powerful telescope - which meant we could see the entire moon, curve and all. 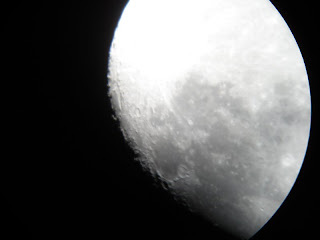 We were able to put our cameras up to the telescope and get pictures of it all. What a night! And all for 15 euro.....expensive, huh?!?! So that´s my little ´P.S.´ for La Serena.....how could I have forgotten a night like that? Not so chilly in Chile! From South to Mid-Way up!